Canadian tennis player Milos Raonic is out in the second round of Wimbledon for a third consecutive year. Milos Raonic didn't mince words when describing his latest early exit from the All England club. 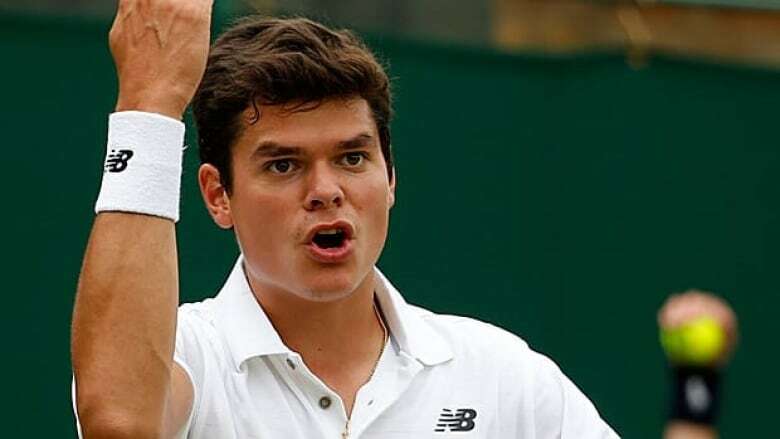 Raonic was eliminated in the second round at Wimbledon on Thursday as he dropped a 7-5, 6-4, 7-6 (4) decision to Igor Sijsling of the Netherlands. The loss left Montreal's Eugenie Bouchard as the last remaining Canadian player in singles competition. She beat Ana Ivanovic on Wednesday to advance to the third round. Sijsling needed just over two hours to complete the straight-sets victory over Raonic. "At one stage I lost 12 points in a row — pathetic," Raonic said. "When I did have chances he played well and I couldn't do what I wanted to do. "Wimbledon's still my favourite tournament. It's me that's the problem, not the court." Raonic had opportunities to break Sijsling in the second set and get back into the match, but the hard-serving Dutch native had an answer every time. "At the end of the second set I had those three break point and he hit huge serves to save them, I didn't do enough with second serve and he put a lot of pressure on me, he said. "He played much better than I expected. I was trying to force myself in the second set. He found the answers when I did get something going." Raonic, the No. 17 seed from Thornhill, Ont., has now lost in the second round here in all three career appearances at the Grand Slam event. After winning just a single match over the short grass-court season, Raonic will look ahead to the summer hardcourt campaign most suited to his big-hitting game. He said he's looking forward to a short break before getting in his first long-term training with new coach Ivan Ljubicic. "It will be three weeks of hard work, I'm looking forward to it, he said. "I know I can gain confidence from working on my game. I want to get things right." Earlier in the day, Ottawa's Jesse Levine dropped a 6-2, 7-6 (7), 6-3 decision to eighth-seeded Juan Martin Del Potro of Argentina. Del Potro, the 2009 U.S. Open champion, overcame a three-point deficit in the second-set tiebreaker before taking the third set in 31 minutes. "In the first set I was grasping at everything, it took me a set to settle in," said Levine. "In the second I started to play well, I served for the set and saved a couple of set points. "But guys in the top 10 can come up with the big shots at the right moment and that's what he did. I'm happy with how I played and the showing I had." The loss prevented Levine from equalling his best career Grand Slam result. He reached the third round at the All England Club in 2009. Levine, the world No. 112, said he had a private moment before playing on Centre Court at the All England Club for the first time. "I had a locker-room attendant take me out before the match just so I could see what it was like," he said. "It was the first time I had set foot on it and I didn't want to be a deer in the headlights during the match. "It was different when it was full of people and I was in a pressure situation, but overall it was amazing. I'd watched Wimbledon at home and now it was me playing out there." Novak Djokovic and Serena Williams restored a semblance of order to this wildest of Wimbledons. A day after Roger Federer led a mass exodus of high-seeded players and favourites, the top-ranked man and woman sailed into the third round with straight-sets victories. Djokovic defeated American qualifier Bobby Reynolds 7-6 (2), 6-3, 6-1 under the retractable roof on Centre Court, a few hours after Williams beat French 19-year-old Caroline Garcia 6-3, 6-2. In fact, after Wednesday's series of shock upsets, there wasn't a big surprise to be had at the All England Club. There were just two injury retirements — compared to seven on Wednesday. Instead, there was the familiar sight of covers being pulled over the courts as the rain arrived for the first time this week, forcing the closure of the roof and the suspension of a number of afternoon matches until Friday. Having seen both Federer and Rafael Nadal knocked out in the first three days, Djokovic also faced surprisingly stiff resistance from Reynolds in the first set. However, he dominated the tiebreaker and had little trouble from there, breaking Reynolds twice in the second and third sets. In the process, Djokovic made this the worst Wimbledon for American men in more than a century. Reynolds' loss means none of the 11 in the tournament advanced past the second round, the first time that's happened since 1912. There were no American men in the tournament that year, although none reached the third round in 1911 either. Williams is still the favourite in the women's draw, however, and will now go from playing an opponent 12 years her junior to facing one 11 years her senior. Next up for the 31-year-old American is Japan's Kimiko Date-Krumm, who at 42 became the oldest woman to reach the third round at Wimbledon in the Open era. Date-Krumm beat Alexandra Cadantu of Romania 6-4, 7-5 to advance this far at Wimbledon for the first time since 1996, when she went to the semifinals. "I have so much respect for her," said Williams, who herself became the third-oldest woman in the Open era to win a Grand Slam tournament when she captured this year's French Open. "I think she's so inspiring to be playing such high level tennis at her age. And she's a real danger on the grass court, I know that. I definitely will have to be ready." "I don't know how she's able to do so well," said Williams, adding she doesn't expect to be around for another 10 years. "I didn't see myself playing at 31. I definitely do not see myself playing at 42." Last year's runner-up, Agnieszka Radwanska, also breezed into the next round with a 6-1, 6-3 win over Mathilde Johansson of France which had to be completed under the roof. In the men's draw, seventh-seeded Tomas Berdych, the 2010 runner-up, beat Daniel Brands of Germany 7-6 (6), 6-4, 6-2. No. 6 Li Na of China looked in trouble for a while before overcoming a poor second set to beat Simona Halep of Romania 6-2, 1-6, 6-0. Other seeded players to win included No. 11 Roberta Vinci and No. 14 Samantha Stosur. Bernard Tomic of Australia advanced by defeating American James Blake 6-3, 6-4, 7-5. Tomic's father and coach, John Tomic, is barred from tournaments after allegedly assaulting his son's hitting partner.